Resorts World Manila once more had been alive as The Voice of the Philippines kicked of to shave the number of the artist to Top 3 for each Team on February 7, 2015. The New mechanics had also been laid out. Kokoi Baldo admitted that he missed his home in Boracay. Sarah shared that his attachment to his island had been evident. Sarah reminded him that it was his dream to share his music to those he could reach. Kokoi performed ‘Could You Be Loved’ with the jive and backdrop of what seemed to be a piece of Boracay. Sarah stood to cheer for him and she seemed proud. Bamboo said that he did a nice rendition. Sarah shared that he had been vocal about his longing for his home. She also told him that he seemed to be home everytime he performs on stage and told him that he is an important part of the music industry. Jason Fernandez shared that he had been inspired by his family and by his dream. He hopes that with The Voice of the Philippines, he will be able to give a better life to his children and his wife. Singing, ‘Moves Like Jagger’ by Maroon 5, he tries to capture the attention of the viewers. Lea said that he is headed to the right direction. Sarah shared that he never failed to surprise her. She also shared that his heart to provide for his family inspired her too. 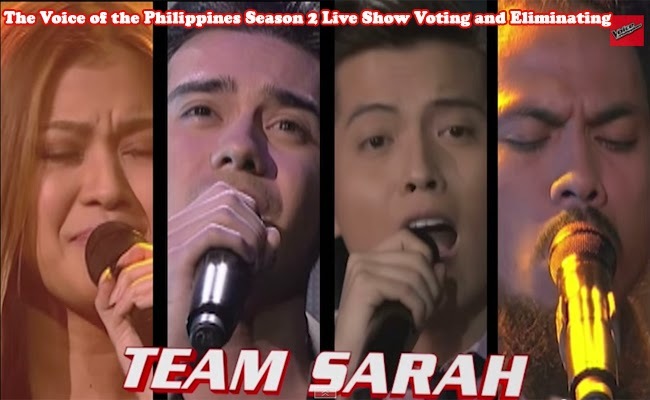 The Voting lines for Team Sarah had been opened, and at the same episode the results will also be revealed and Sarah can also save one artist.